The Itsy Bitsy Spider Crochet: Vege-gurumi? I have several vegetarian friends and even know a few folks who are completely vegan, but until recently, I never thought about how this preference influences a person's choices when it comes to clothing, gifts, or other non-food items. So, what changed? While veganism isn't all that common (Wikipedia estimates between 0.2 and 1.3% of the US population), portions of the philosophy do permeate even to people who consider themselves omnivores. For example, I often choose to eat meat and use animal products such as wool and leather in my day-to-day life. But, given the opportunity to purchase the same or similar product in an animal-free material, I almost always choose the latter. The difference is "leatherette" interior in our car, a fabric business card case, or a blanket made with artificial down. In these cases, the animal-free product is as good (or better) than the one that uses animal products and often costs less in the end. That being said, I'm in something of an awkward position when it comes to my craft. You see, I love working with wool and alpaca blends. I love the way the finished project turns out. And sometimes (as with the brushed crochet technique), there's just no substitute for animal fibers. The customer who contacted me was intersted in purchasing a vegan version of my sushi set for her son, and that left a couple of problems with the set I currently have listed. First, the set listed includes two definitely non-vegan nigiri. Because vegans do not eat eggs or fish, including rolls with tamago or maguro was definitely out. As a result, the customer requested 2 inari sushi instead. Inari look like little dumplings and it should not be too hard to come up with a pattern for them, so I happily agreed. The second problem with the set I have listed is that I used wool blend yarns in some of the pieces. Because wool is an animal product, I would have to find a substitute (acrylic, cotton, or bamboo). Now this had me pretty bummed. I had poured over the yarns at our local craft store before selecting the colors I would use to create my original sushi set and finally decided on a mix of acrylics and wool blends. The wool blends I selected were used on the seaweed wraps for the maki, the avocado centers of the maki, and the wasabi. Upon returning to the craft store to look for substitutes, I found that I had a real challenge at hand. The colors on the wool yarns were, in my opionin, perfect for sushi. And the exact same colors just weren't available in acrylics, cotton, or bamboo. I found myself scouring the yarn selection for colors that were close to what I wanted, and boy, was that a challenge! Over the last couple days, I have put together the maki for the vegan sushi set with the acrylic substitutes and I have to admit that I'm really starting to like the substitutions. I choose a Bernat Satin Yarn for the seaweed wraps, and I really like how the fiber adds an extra shine to the pieces. 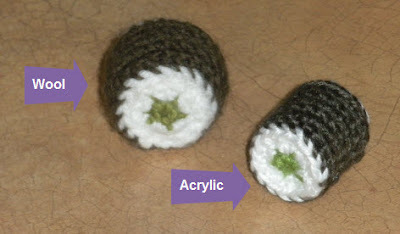 Even though I still think the wool blend had the more accurate color, I feel like the acrylic maki are more realistic. Another thing I noticed about the acrylic maki is that they tended to retain their shape better when stuffed. Granted, the wool maki in my picture is one that my daughter made off with and it's seen more than a fair share of abuse. But even before it was chewed, the roll seemed quite a bit puffier. The moral to the story? Well, I'm not sure there is one. I'm definitely not going to give up working with animal fibers. But, I'm finding out that making substitutions based on customer requests, while challenging, can also be very rewarding.